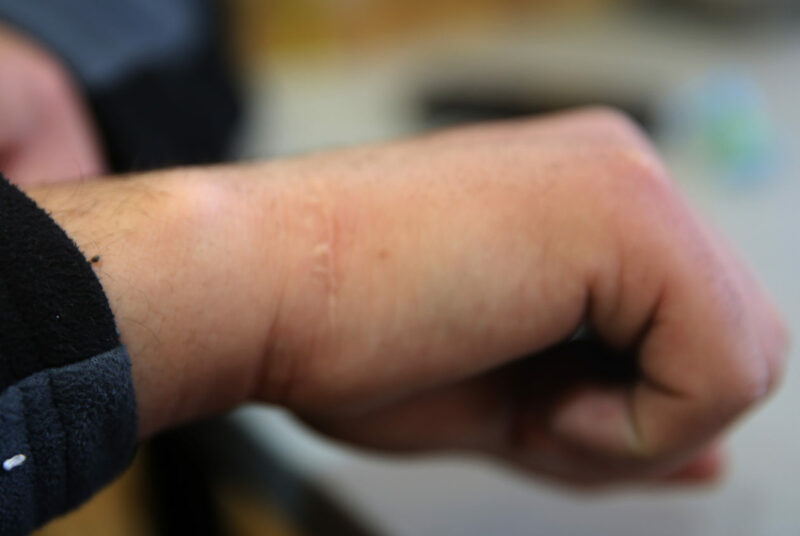 The effect of the cable-ties on Ghassan’s wrists after two days of the incident. On the 14th January 2017 Israeli paratroopers detained Ghassan a 20 year old Palestinian man from Hebron. Six paratrooper soldiers were in a Palestinian neighborhood, in the Old City, where they were checking the ID’s of people going by. Ghassan was in a car with his cousin when they were stopped. Neither he or his cousin had their ID with them at the time. They knew their ID numbers off by heart and told them to the soldiers but this made no difference to their situation. After one hour the cousin was let go but Ghassan continued to be held. He [the soldier] took my phone and wanted my password. I said “no.” They blindfolded me and tied my hands like this (demonstrated, his hands behind his back) with cable-ties. I was held like this for 20 minutes on the street. Once they let my cousin go, he called my brother and father. The soldiers took me to the military base, still blindfolded and hands still tied, they kicked me and hit me with their guns as they took me into detention. They were very angry soldiers. They wanted a fight, with everyone, not just me. They said bad things to me, and I responded. They made me sit outside in the military base the whole time I was detained. They refused to let me use the bathroom for 40 minutes. I had to keep asking until they eventually let me go. They called me a terrorist. They treated me really badly. They pushed me around. At one point I was pushed really hard. One of the soldiers spoke very good Arabic. I wasn’t afraid, they were going to either arrest or kill me. But after five minutes my arms were numb from my hands being tied. I told them many times that my wrists were hurting. In particular my right hand. I have a sore wrist, from a previous surgery. When I told the soldier, he tightened the cable-tie, deliberately, on my right wrist where the pain was. I was taken inside the military base near the containers, made to stay there, outside, the whole 2 hours and 45 minutes. [Note that it is the middle of winter here. That night, the weather did not reach 6 degrees celsius and Ghassan was lightly dressed]. I was released at 11:45 pm that night, taken through the Tel Rumeida checkpoint. I wasn’t given my ID back, my father had to go and get it from the soldiers before we could leave. 2 days later, my wrists are still hurting. These soldiers are some of the worst in the city. I will often say good morning to soldiers at the checkpoints as I go through to my shop. But the paratroopers are the worst soldiers in the Old City. They’ve been treating people very badly.